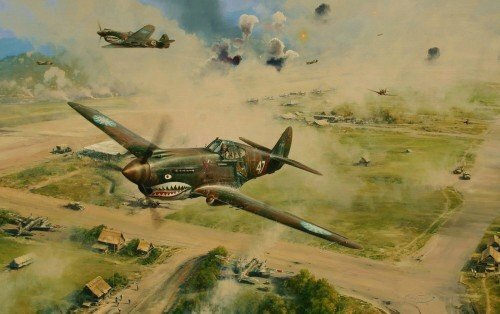 P-40's of the AVG Flying Tigers 3rd Pursuit Squadron - Hell’s Angels - deliver a deadly strafing attack on a Japanese forward air-base in China, summer 1942. With their Allison engines screaming at full throttle, AVG Aces Tommy Haywood and Robert Smith, lead the charge as the Hell’s Angels leave a trail of havoc and destruction behind them. Robert Taylor has created a masterpiece to honor the ‘Flying Tigers’ and the release is autographed by legendary ‘Flying Tigers’ including four of the AVG’s most respected pilots who, since signing the prints, have sadly passed away, giving even greater meaning to this edition. The Military Gallery is proud to now release this historic commemorative edition in tribute to this immortal unit, providing aviation art connoisseurs with a remarkable collectors piece.